February 19, 2012 -- The elation surrounding Steve Torrence’s finest NHRA Top Fuel performance earlier this weekend turned to disappointment on Sunday afternoon at Firebird Raceway. Torrence put up career-best Top Fuel numbers (3.788 seconds and 322.04 mph) and earned the No. 3 starting position at the track where he had driven into the semifinals in his last two visits. Then he collected his first 2012 round win, defeating Brandon Bernstein in the opening round by leaving the starting first. He never looked back. 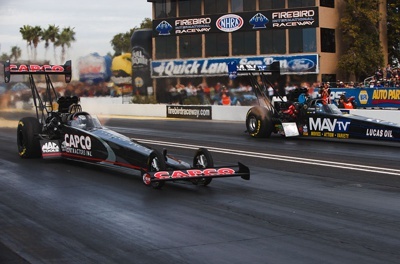 His Torrence Racing/Capco Contractors Inc. dragster stopped the timer in 3.801 seconds at 322.04 at a 3.794. Unfortunately, things were reversed in the quarterfinals. Clay Millican got the advantage at the line and turned on the win light in 3.838 at 317.18 mph to Torrence’s 3.796 at 318.99. “Our car ran really, really well this weekend and I was pleased with the team,” said a dejected Torrence. “Everyone did great and I want to thank them. I just dropped the ball and let the guys down. We had a race car that could’ve won the race. I was just late. He is already looking ahead to the Tire Kingdom Gatornationals at Gainesville, Fla., March 8-11. “I have two solid weeks to reflect on the bad reaction time and I will work hard on correcting the problem so it won’t happen again,” Torrence promised.